Please sign in or become an EPIC Member to access video. Combine grounded research on human-technology interactions with an openness to speculation and imagination. 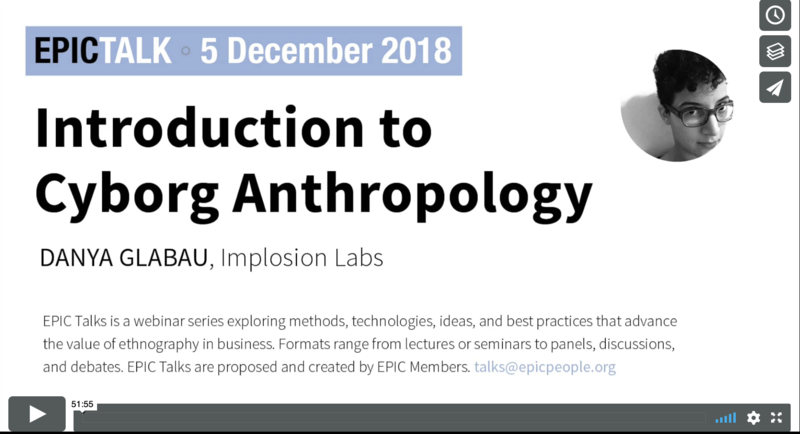 This webinar introduces cyborg theory and cyborg anthropology. The figure of the cyborg is, in the words of Donna Haraway, a "condensed image of imagination and material reality," and in a cyborg world, "nature and culture are reworked." A cyborg anthropology approach combines grounded research on the realities of human-technology interactions with an openness to speculation and imagination. Thinking with cyborgs offers researchers a way to challenge their assumptions about how emerging technologies shape everyday life and to imagine bigger, better futures in which humans and technology are collaborators rather than enemies. This webinar will explore these possibilities through summaries of canonical texts and real-world examples of the ways that humans and technology work—or, sometimes, fail—together. Danya Glabau, PhD, is an anthropologist of medicine and technology and a teacher and enthusiast concerning all things cyborg. She holds a PhD in Science and Technology Studies (STS) from Cornell University and a B.A. in Biological Sciences from Cornell University. Her independent research has looked at patient activism and the pharmaceutical industry and at the emergence of the current generation of virtual reality technologies. She is Founder of the speculative ethnography research group Implosion Labs, an Adjunct Instructor in the Technology, Culture, and Society department at NYU Tandon School of Engineering, and a Core Faculty member at the Brooklyn Institute for Social Research.